"Brothers in Arms 2: Global Front HD" offers World War II battle action. (Gannett) -- With more than a million units sold in its first month, there's no question Apple's much-hyped iPad is here to stay. But is this 9.7-inch touch-screen tablet as ideal for playing games as it is for reading electronic books, surfing the web, watching video or typing out homework? Absolutely. Spend just five minutes with your fingers on a high-definition iPad game and you'll know why it's a winner. And hey, a 12-hour battery for gamers on the go doesn't hurt either. Keep in mind the iPad will also work with most of the games already available for theiPhone and iPod Touch. Whether you already own an iPad or plan on buying one, the following are four examples of extraordinarygame applications available for purchase at the App Store (itunes.com). Note: Most iPad games are not rated by the Entertainment Software Rating Board (ESRB), but please see our recommended age for each title below. The celebrated World War II action series has made its iPad debut, allowing you to battle against computer-controlled enemies in the solo story mode or online with up to five friends on a handful of multiplayer maps. "Pinball HD" is a high-definition collection of old-school pinball games for the iPad. 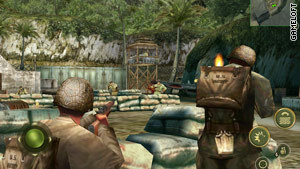 Use your fingers to move your squad throughout the war-torn environments (including hot spots in North Africa, Normandy, Italy, Germany and the Pacific), pick the best places to duck for cover and use a number of weapons, including sniper rifles, machine guns, bazookas and flame throwers. You can also hop into a vehicle, such as a tank or jeep, to press your way across enemy lines. This high-tech twist on the classic crossword board game can be played in one of four ways: against the game's artificial intelligence; versus a friend beside you in a Pass n' Play mode; over Wi-Fi (including social networking support, such as Facebook integration); or in a new Party Play mode, in which up to four players can manage their tiles on an iPhone or iPod Touch and then wirelessly play their words on the nearby iPad game board. The goal of Scrabble, of course, is to collect as many points as possible by spelling out words from letter tiles in your hand, each of which is worth a certain number of points. The player with the highest number of points at the end of the game wins. The only downside? The relatively steep cost of $10 for the app. One of the most popular apps on the iPad is a nod to the ol' silver ball. "Pinball HD," as you'd expect, is a high-definition collection of pinball games for the iPad. 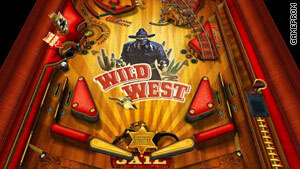 The game ships with three tables to play on -- "Wild West," "The Deep" and "Jungle Style" -- and each one boasts great-looking graphics, including support for anaglyph 3-D glasses (not included). See the entire table in the landscape mode (holding the iPad horizontally) or by toggling between a close-up "flying table" view and full table view when the iPad is held vertically (slide both your thumbs up or down the screen to toggle the camera view). With its ball physics, built-in help and a local and global high-score board, "Pinball HD" is a great pick for players of all ages. One of the most popular iPhone games is now available in high-definition for the iPad, and with a few extra feathery features, too. In case you haven't played the original, a group of scheming green pigs have stolen eggs from a bird's nest -- and now the winged warriors are calling for revenge. This physics-based puzzle game has you flinging birds out of a giant slingshot from the left side of the screen to the right, and you must aim just so, with the ideal amount of force, to destroy all the pigs within the allotted number of turns per level. Each of the five bird types have their own unique skills that can also be used to topple the pigs' elaborate houses, leaving the swine exposed for a final blow.